First the area will be leveled and tamped. Tamping the area will help prevent shifting of the wall although it will shift a small amount no matter what. Next the area will be cut square to prevent any water seepage into the wall. Therefore preventing the wall from bowing out due to water seeping into the wood ties. A gravel foundation will be put down and tamped to provide bottom drainage. Draining any water away from the wall again preventing it from bowing out the wall or eroding the dirt behind the wall. After the first tie is laid and leveled, then steel will be used to drive through the tie into the ground to secure the wall. This process will be repeated up the wall. To fill the between the dirt and the back of the wall gravel is used to fill the space and tamped. Our licensed and insured landscaping company is highly committed to making beautiful and attractive gardens for businesses, cities and towns. Many railroads run directly through cities and towns. There are a variety of creative ways the city or town can request to make the railroad scenery look attractive to local residents and visitors or tourists. It is extremely important to have an attractive railroad scenery if the city or town is a touring community that attracts vacationers. Elkhart Landscape For City Garden Railroad Layouts would be your best choice in creating and designing a peaceful and serene garden railroad track in your community. Elkhart Landscape For City Garden Railroad Layouts are the experts in creativeness, inspiration, and designs for garden railroads. We offer a variety of garden packages and plans you may choose from all at very affordable prices. Every garden railroad creation we design comes with a nice valuable guarantee. The railroad section can look amazing and vibrant throughout all seasons. We can create and design winter, spring, summer and fall garden railroad layouts. Our skilled landscape contractors use high quality garden railroad supplies to help them complete an amazingly beautiful job. Garden railroad roadbeds add attractiveness to passerby, visitors, vacationers, and local residents who reside in the city or town. If you are interested in a garden railroad track then you should contact Elkhart Landscape For City Garden Railroad Layouts. We can provide you with a free consultation to determine the garden railroads needs. Free quotes or estimates are also offered to our clients. No other landscape company can beat our professional service, prices, or guarantees. Our hard work shows how much we care about the beauty of a community. Beauty adds value to any property and makes it really stand out. Our company can e found listed online, in phone directories and in newspaper ads. We are becoming more and more popular as we deliver our landscaping services in and around the area. Garden railroad layouts can be custom planned and designed just the way you want. Our team of skilled landscaping experts can help you plan, design, create, and inspire from beginning to end. We offer seasonal maintenance landscaping plans so you may change the garden scenery to match each season. We take pride in the amazing work we provide our clients. We strive for excellence in leadership by keeping up-to-date on modern landscaping methods and skills. Our company has introduced these railroad gardens layouts to a few clients already and they have been proved really successful. Gardens with fountains and picnic areas surrounding the railroad attract many people to their beauty. We can create these amazing landscape works of art for great low prices and in a whole lot less time than it would take you or another company to complete it. 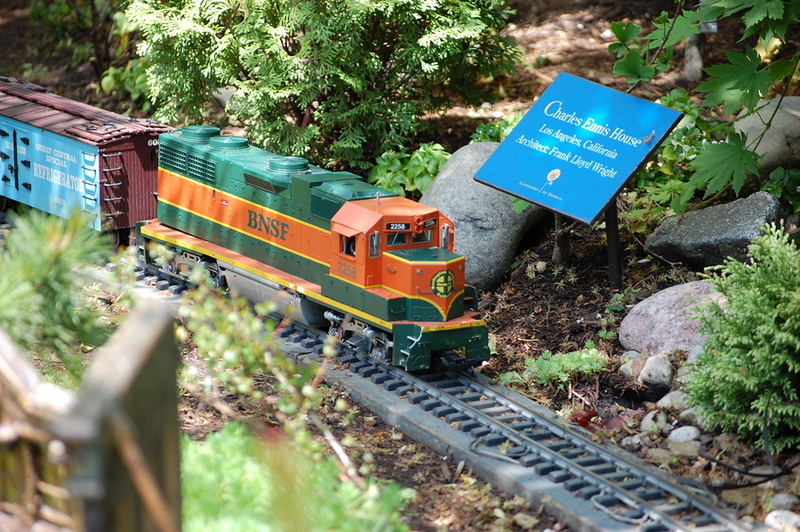 Contact us now to get a head start on your railroad garden.